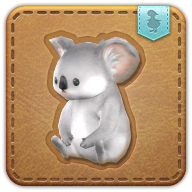 Summon your koala joey minion. Shows no signs of stress or crotch rot, so hug away. This small ursine creature dropped onto the retainer who was cutting down its tree and has apparently decided to see the world. Though ordinarily placid, it can be savage when threatened, and folk are cautioned against─ Awww, look at the adorable little critter!